Epiphany, shown in the following figure, is the Raspberry Pi’s web browser. It works just like any other web browser. You can type a URL into the URL box and open multiple tabs. Epiphany with the main Google page loaded. But it’s not quite like other browsers, and there are a couple of things you need to know about it. It has a strange name. The first thing isn’t a big deal. The weird name means sudden realization. It’s really just an excuse to give the Pi a web browser with a name that has pi in it. The second thing is more important. The Pi is not a fast computer, and Epiphany is not a fast web browser. It can take a minute or two for some pages to load. Epiphany also has problems loading some pages. If you see an error message when you try to load a page, it’s not usually your fault. It’s fine to use Epiphany to test a web server on your Pi. So if you need to look things up online, it’s best to use a browser on another computer. Otherwise, you’ll be waiting for it to finish loading pages — a lot! In Epiphany, you can search the web for a word or phrase by typing it into the URL box and pressing Enter. Epiphany uses a search engine called Duck Go. It gives similar results to Google, but includes bigger ads. If you want to use Google instead, you can open the main Google page and search from there. The Pi has another browser called NetSurf hidden away in the preinstalled applications. It’s quite a bit faster than Epiphany — it’s almost fast enough to be usable — but it’s not so good at getting the layout of web pages right, so words are often smushed up into other words. You can’t use the most popular browsers, like Chrome, Firefox, or Internet Explorer, on the Pi. You can install a special version of Chrome called Chromium, but you can’t install it from the desktop. 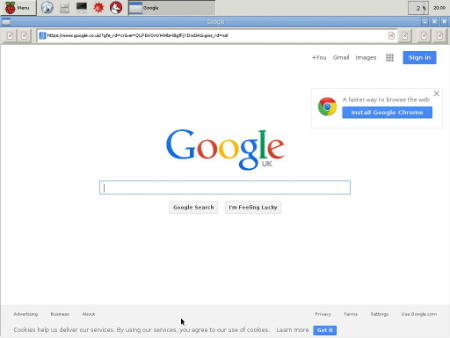 When you know more about Linux commands you can try searching the web for Install Chromium on Pi for instructions.